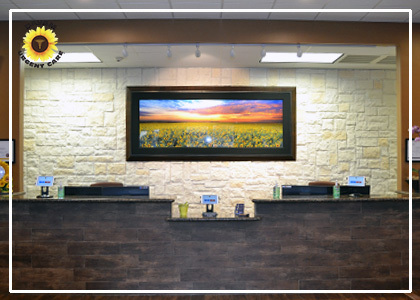 At Davam Urgent Care located near Montgomery, TX we provide quick and cost-effective drug screening and drug testing for both employers and patients. In addition, we also offer alcohol breathalyzer screening. Patients can walk-in 7 days a week, 8am-9pm for drug testing. To make the process even easier, employers can set up an occupational health account with our front office. Our staff will keep your information on file, and are able to fax over results shortly following the visit. In order to make drug screening as affordable as possible, three different prompt pay options are offered. Six panel drug screens are $35. Ten Panel drug screens are $45. Twelve panel drug screens are $55. Davam Urgent Care is also able to offer many other occupational health services including on-site digital x-ray, non-DOT physicals, pre-employment physicals, animal bite treatment, tuberculosis (TB) testing, tetanus shots, laceration repair, and flu shots. For more information on Drug Screening and Drug Testing at Davam Urgent Care in Magnolia, TX please visit Occupational Medicine or call (281) 583-1980. In addition to affordable prompt-pay options, we are in-network with most major workers compensation insurance companies including Texas Mutual, The Hartford, Creative Risk Funding, Sedgwick, Travelers, Gallagher Bassett, and many more under the Texas Star Network. To view a complete list of the workers compensation insurance carriers accepted visit https://davam.com/insurance/ or contact our billing office at (713) 487-3030. Davam Urgent Care proudly serves the Montgomery, TX zip codes of 77316 and 77356.